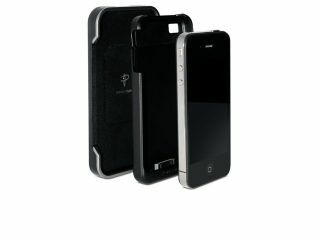 Powermat has announced its latest range of wireless goodies, showcasing a new batch of superslim cases and dedicated docks for the iPhone 4 and BlackBerry handsets. "Charging your iPhone 3G, 3GS or 4 is now as simple as dropping on a Powermat," says the release and having seen it in action we can vouch that it is an impressive piece of kit. The case is nothing like the bulky cases of before. The charging plate has been created so it is flush with the handset. In short, this is a case you will be able to keep on your phone and not be embarrassed that it resembles a brick. Alongside the case is the dedicated charging dock, which the phone sits nicely in. There is also casing for the iPhone 3GS, but this is still a touch on the chunky side. The BlackBerry Bold 9700, Curve 9300 and Curve 8500 series also have brand-new casing which fits the look of the phone and is as inconspicuous as it can possibly be. There is also a dedicated charging matt for the above handsets, but they will also work on any of the Powermat range. Again, there is slightly bulkier casing for the older Bold 8900, Curve 8300 and Pearl 8100 range of handsets. The wireless charging system bundles for the iPhone 4 and BlackBerry handsets have a UK release date of 'end of October' and will be available from the Carphone Warehouse for £49.99 each. Powermat has also announced two new mats for the UK: the Powermat 2x and Powermat 3x. These do exactly what they say on the tin. The Powermat 2x has space for two devices and the Powermat 3x is for three devices. The two-position Powermat also comes with a Powercube and has a UK release date of 'end of October' costing £59.99. The Powermat 3x is also out late October and will set you back £79.99. Both of these will also initially be available at the Carphone Warehouse.